Based off of the best statistics, I’ve found, there are over 187 million blogs. People obviously love reading and writing blogs. There is little doubt then, that a business that doesn’t speak to its customers through blogging, is definitely alienating its customers. In this day in age, it is very easy for any business owner, no matter how small, to create a website. These websites must build customer relationships, while pulling in business from all over the world. In the past, business owners needed to rely on extremely expensive web design companies to build them a site. Those days are now in the past, thanks to a fabulous program called WordPress. 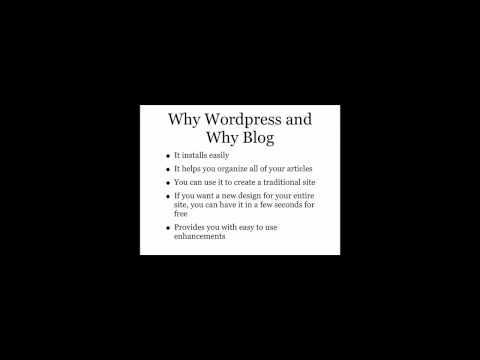 WordPress, is a free blogging tool kit, that brings the power of internet blogging to the people. WordPress is the largest self-hosted blogging tool in the world, used on millions of sites and seen by tens of millions of people every day. The goal of this series of articles is to help people get started with WordPress. It really is quite easy. There are two versions of WordPress. 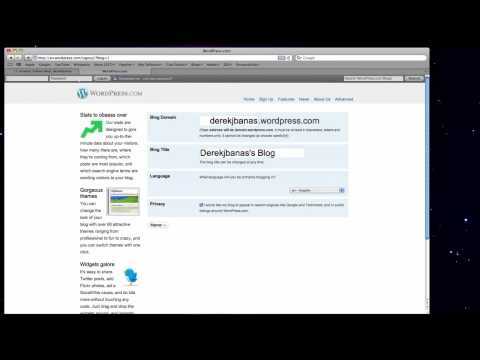 There is the blogging software you can use with WordPress, at wordpress.com. This operates in a way similar to most social networking systems like Myspace, Facebook, etc. There is another version, that you host on a hosting company, such as Go Daddy. This version can be downloaded from wordpress.org. If this is a bit confusing don’t worry. The video tutorials will show you exactly how to set up both of these versions of WordPress. WordPress is so easy to use, because it takes care of all the technical stuff. This allows you, to spend all of your time writing. Whats better, is that WordPress allows you to easily create amazing tools and new web designs, with ease. We’ll get to them later. It installs easily! Normally, it will take you no more than 5 minutes. It helps you organize all of your articles in a logical manor. Search engines absolutely love WordPress websites. If you follow this tutorial, your Google Page Ranking will probably be higher, than if you hired a web design firm. WordPress is not just used for blog websites. You can use it to create a traditional site as well. There are many pre-made web designs for you to pick from. If you want a new design for your entire site, you can have it in a few seconds, with no design or technical knowledge. Your customers want to interact with your website. WordPress provides you with easy to use enhancements that allow you to add bulletin boards, calendars, RSS feeds, video, audio, shopping carts, etc. It will block unwanted spam from your site. As I mentioned before, a WordPress.com site is similar to a social networking site. It is hosted on WordPress computers. It is free, for the most part, and extremely easy to set up. Almost every technical activity is taken care of for you such as: saving your content, blocking spam, security, upgrading, and promotion. The Custom CSS Upgrade allows you to use your own CSS (Cascading Style Sheet) to customize the appearance of your blog. CSS allows you to change fonts, colors, borders, backgrounds, and even the layout of the blog. The cost is $14.97 per year. If you want to use a custom domain name that doesn’t end with wordpress.com you can either pay WordPress $14.97 to both register and host your domain for a year. Or if you already own a domain name, they charge $9.97 for you to host that domain name on their servers. WordPress gives you 3 gigabytes of space to use for free on their computer. If you want more, you get 5 GB for $19.97 / year, 15 GB for $49.97 / year, or 25 GB for $89.97. If you don’t want WordPress to put ads on your site, you have to pay them $29.97 / year. There is a limit to the number of private users you can have on your site. If you wish to buy the unlimited users, instead of staying at the standard 35, that will cost you $29.97 / year. Now if you want to host your own site and control everything, the version of WordPress found on wordpress.org, is the way to go. You will gain access to a larger number of web site designs, called themes. You will only be limited in size by your chosen hosting company. You will also gain access to a larger number of tools, called plug-ins. Plug-ins, give you access to tools such as: e-commerce systems, a wide assortment of media tools, and basically anything else you can imagine. The negatives of hosting your own site include: you must pay a hosting site to host your site (avg. cost: $7 to $15 / month), it is more complicated to set up (many hosting companies will set upWordpress for you), you are responsible for upgrading your software, and your sites up time will only be as good as the hosting company. I personally, use Go Daddy for hosting, but there are a large number of other great hosting companies. The minimum requirements a hosting company must meet include having, PHP version 4.3 or greater and MySQL version 4.0 or greater installed. It’s also probably in your best interest to install on a Linux rather than a Windows server. The best hosting companies include: Blue Host,DreamHost, MediaTemple, and Go Daddy. In the next article, I will go into detail on how to create a WordPress.com account. You should do this even if you plan to host on your own site to gain access to Akismet, a great anti-spam tool. An additional benefit to starting with a WordPress.com account is that it gives you the opportunity to see if WordPress is right for you. Whether you chose to host on WordPress or from your own hosting company, the interface of WordPress is nearly identical. So, if you learn how to operate a blog on WordPress.com, you’ll know how to run WordPress on a separate hosting plan as well. I hope this clears up any questions about using WordPress. Next, I’ll dispel any beliefs that WordPress is complicated to set up. The Blog How to Set Up Series continues. If I missed anything, please tell me how I might improve the post. The Blog How to Set Up Series continues, by teaching how to install WordPress on most any domain host. This is how you would manually install a WordPress blog system on Go Daddy. The process of installing manually on most all other hosting companies, like Go Daddy, is nearly identical. Here are the directions from Go Daddy’s website. 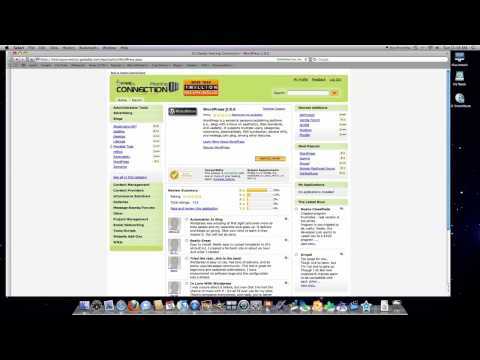 Installing WordPress using Hosting Connection is the easiest way to get WordPress up and running on your domain. However, you can install it manually into your shared hosting account if you so desire. * A compatible hosting account which supports PHP and MySQL. * Your FTP account login information. This includes the FTP User Name and Password for your hosting account. * A MySQL Database for WordPress and the Database information. * The latest version of WordPress. NOTE:This article assumes you already have a compatible hosting account and your FTP login information. If this is not the case, obtain these items and then return to the article. 2. In the My Products section, select Hosting. 3. Next to the hosting account you want to modify, click Manage Account. 4. In the Databases section of the Hosting Control Center, click the MySQL icon. 5. Click Create New Database. 6. Enter a description, WordPress for instance. 7. Enter a user name and password. 8. Specify your MySQL version. 9. Specify whether you want to allow Direct Database Access. NOTE: Direct Database Access is a less secure way to manage your hosted databases which most users do not require. If you do not need to access your database remotely, then you should not enable Direct Database Access. For more information, see Why Connect Remotely to Shared Hosting Databases. 10. Verify your MySQL database settings. If everything looks OK, click OK. It may take a few minutes to create your database. Click your browser’s Refresh button to check if your database is ready. Now, you need to download the latest version of WordPress from their servers. This can be found at WordPress.org. 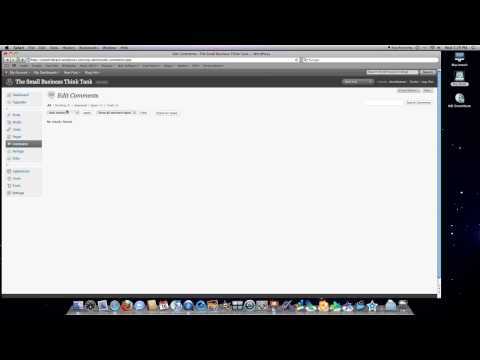 Extract the WordPress ZIP file you downloaded and open the WordPress folder. Locate wp-config-sample.php and open it with a text editor like Notepad. Save a copy of the file as wp-config.php. You will be working in this file from now on. Go to WordPress’ online key generator and insert the keys in place of the placeholder text in the wp-config.php file. When you are finished, save and close the wp-config.php file. Using an FTP client such as FileZilla, Fetch or gFTP, FTP into your server and copy the WordPress folder to your hosting account. This directory can be stored anywhere in your account, in this example it will be in the root (http://www.coolexample.com). 1. Begin the WordPress installation by going to http://www.coolexample.com/wp-admin/install.php, where coolexample is the name of your domain. This will launch the WordPress installation process where you’ll be asked for your Blog Title and Email address. 2. Enter this information and click Install WordPress. 3. The next screen will provide you with a username and password to log into your blog for the first time. Note that information, then click Log in. 4. Enter the username and password you just noted and click Log In. The WordPress Dashboard will display. This is the main administration center for your blog. Your WordPress blog is now installed. For assistance in the set up and maintenance of your blog, see the Getting Started with WordPress page at WordPress.org. The Blog How to Set Up Series continues, by showing how to install WordPress on Go Daddy, the easy way. Here I show you the easy way to install WordPress on a Go Daddy hosted site. 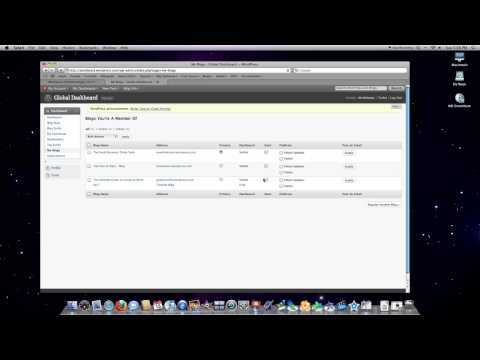 The Blog How to Set up Series continues, by showing how to use the Global Dashboard. That completely covers all the options found both under the Global Dashboard and My Account categories. Next, I’ll cover everything you ever wanted to know about posting articles and every other feature available on WordPress.com. The Blog How To Set Up Series Continues. So, now your ready to start posting articles in WordPress. There are two approaches to writing articles on the web. One, is to just write about whatever you want randomly and hope someone finds your content of interest. The other is to start out with a plan. I’ll cover search engine optimization of websites in another article, but for now I thought I’d introduce some things to think about as you plan your articles. By timeless, I mean, the article should be of interest to a large number of people a month from now. This is important, when your trying to create a large content driven website. Let us say, you want to have 100 interesting articles on your site. If you create 5 per day, but 4 of those five will have no value to anyone in a month, you are working against yourself. Instead of reaching your goal in 20 days, it will take you 100 days, to reach your goal. Original content, is invaluable. There are far to many aggregators of information as it is. The only way you can make your site different, is to create content that is not available any where else. So, go get inspired by something, and create some original content. Finally, do your best to talk like a real person. Try to be funny, tell stories and don’t get stuck writing articles that are aimed only at pleasing the search engines. Many search engine optimization tricks are geared toward making it seem like a website is of value. Do your best to appeal to real people and search engines, by just making a valuable, timeless, and original site. Now, Back to WordPress posting. I’m assuming, you are logged into your WordPress.com account right now. At the top of your page, drift your mouse over the link titled My Dashboards. When you do, a drop down window will show all the blogs you currently have set up at WordPress.com. Click on one. You are now on a catch all page. Under Right Now, you’ll see a listing of your total posts, pages, categories and tags. The posts, are your articles. Pages, refer to static pages you created, that are more similar to normal website, rather than blog pages. Categories, refer to how you have grouped your articles, with other similar articles. Tags are keywords, that help you define the topics covered in a post. The Recent Comments section, will list all the comments others have made on your blog. Incoming Links, shows you other websites that are linking to your site. The Your Stuff section, shows all of your recent posts. What’s Hot, describes what other sites are talking about. The Section labeled QuickPress, allows you to post onto your blog without thinking about the styling of the post. You just plug in your title, content, tags and whether you want to add media and hit Publish. If you want to save a draft, which will keep others from seeing the post later, click Save Draft instead. Click the From URL tab, at the top of the window that just opened. Click the From Computer tab, at the top of the window that just opened. Just a Note. You are able to link and show your visitors videos for free, as long as they are not being stored on a WordPress Server. The last two parts of the page, show you your recent drafts and stats on the activity of your blog. Recent Drafts are links to posts you have not made public yet. The Stats section shows you how many people are visiting your site and what they are looking at and searching for. To finish off this post, I’m going to walk through the best way to post your articles. First click on the link labeled Posts, on your left sidebar. A new window will open titled, Add New Post. Strike Through: Which people use to eliminate a thought, without deleting it. I’ve never understood this concept. Unordered List: If this list your reading had little dots next to each item, instead of numbers, you’d have an unordered list. Block Quote: When used white space, shows up, before and after a block quote element. It also insert margins for the block quote element. Hyperlink Buttons: One allows you to create hyperlinks, while the other eliminates them. Insert More Tag: When you decide that you want to cut off the article, you can insert the More tag to effectively split the post (mark where the excerpt officially ends). Proofread Writing: Checks for spelling and grammar errors, based off of the preferences you set on your Profile page in WordPress. Toggle Full Screen Mode: This will make the posting area take up your whole browser window. Show / Hide Kitchen Sink: If toggled on, you’ll see additional text editing icons pop up. Toggle it on now! HTML Styling Drop-down: This will allow you to quickly add HTML styles to your article. Align Full: Will stretch your text spacing to make your left and right margins line up with each other. Outdent: Creates a paragraph, in which the first line is left justified and each additional line is indented. The next box is labeled Excerpt. 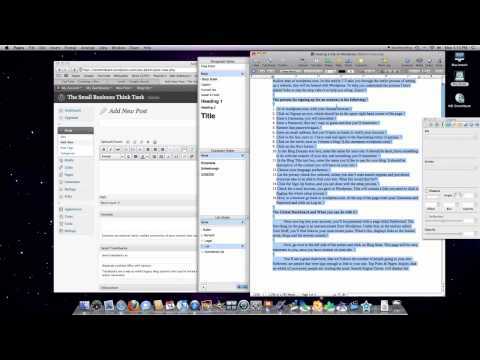 You should create excerpts for all of your articles. It is a brief description of your article. By writing one, you allow your visitors to easily see what content you have that would be of interest. RSS feeds from sites that use excerpts for their articles are much preferred. Also search engines love the keyword heavy excerpts. So just take the time and write them. It is considered a nice gesture to use trackbacks. If you write a post and reference a post from somewhere else, you should paste the URL to that post your referencing here. It provides website owners, with the ability to see who is linking to them. Think of it as a kind gesture. In the Discussion area, you have to decide if you want others to be able to comment on your article. It’s in your best interest, search engine wise, to leave both of these boxes checked. That leaves us with the last three editing areas. Once you write your post, you have to decide what to do with it. Under Publish, click on Save Draft, Preview or show it to the world, by clickingPublish. In the Publish section, there are other options concerning, who you want to see the post or if it should be published later. That ends the “Posting Articles in WordPress” Post. In the next article, I’ll cover the Media, Links, Comments, Ratings and Poll links in your left sidebar. The Blog How To Set Up Series Begins. This article will cover, the rest of the left sidebar, not covered in previous posts. Pages will be the most complicated issue I’ll cover in this article; and I plan to cover it last. If you click the link labeled Media in your side bar, you’ll be taken to your media library. Here you’ll see a list of all the different media types, you have uploaded to WordPress. You can sort or delete these files, either individually or as a group. If you click on the Add New link, which opened on your sidebar when you clicked Media, you be taken to a page, from which you can upload more media. For information on uploading media please refer to the previous post, Posting Articles in WordPress. The Link hyper-link, if clicked will take you to a page that will list all the links you think are important. They are placed in a link category titled Blogroll. A Blogroll, is just a list of links. On the page titled Edit Links, which should be on your screen, you can delete and order those links currently in your blogroll. The category you wish the link to be associated with. You can create a new category here as well. Under the Target Option, it’s probably better to always click _none. Most people, don’t like a website that opens windows all over their screen. The Link Relationship area is were you describe the relationship you have with the person that posted the link. In the Advanced area of the Add a New Link page, there are a few advanced subjects to cover! An Image Address, would be a small photo you would want to be associated with a link. If you type in the address of a RSS feed for the link, WordPress displays the link to the site’s RSS feed. RSS stands for Really Simple Syndication. With an RSS feed you can share the headlines from your blog. By adding the RSS feed to your blogroll, your users can easily gain access to this information at the same location as the link. In the note block, you can add any additional information about the link. Now give the link a rating, if you wish. Go to the top right hand corner of the page, decide if you want to keep the link private and then click save. If you click on Link Categories, on your left sidebar, you can now sort your links into different categories. Enter a Link Category Name, that would be descriptive of the links it will contain. Add a Description for the link Category. Now click Add Category. If you want you can go back to the Edit page under Links, in your left side bar, and move your links into your newly created link categories. By clicking the Comments link, in your left sidebar, you’ll be able to Approve, mark as spam, or trash any comments, all in one place. There are Bulk Actions, you can use to handle many comments with just a few clicks. By clicking on the Ratings link, in your left sidebar, you can give commenters the ability to rate their favorite Posts, Pages, and Comments. You can enable these rating systems, by clicking on the tabs across the top of the screen. If you enabled ratings, by clicking on reports, you’ll see the ratings your posts, pages, and comments have received. There is an option to add polls to your posts. You do this by setting up either a free or pay account with a company called PollDaddy. You can find out more information on that here, polldaddy.com, or check back for a later post. You can create pages, on your site, that do not change. These are called static pages. You create these pages by clicking on Pages, in your left toolbar. You are now looking at the familiar text editing tool you saw when you created posts in the past. Give the page a title. Refer to the previous post, to learn how to use the text editing tools if needed. Decide if you want others to be able to comment on your static page. Now on to the Attributes part of the page. Each of the pages you create will be listed in a menu that goes across the top of your website, down the left, or down the right side depending on the template you choose for your site. Each of these static pages can be all alone or they can be associated with other static or blog pages. If you want this page to be at the top of your page hierarchy, leave the select box, under parent set at Main Page (no parent). If however you want it associated under another page, in the select box, select the page you want it associated with. Under Template, you can choose what template you want associated with this static page as well. Finally, click on the order of your hierarchy of pages if you don’t want them to follow the alphabetical default. Now, click on Save Draft, Preview or Publish after you decide if this page should be available for public consumption. If you want your new static page set as your home page, being the first page people see when they go to your site. Click on Settings, in your left sidebar. Then click reading. Now, under Front Page Displays click in the circle, next to a static page (select below). Select the Front page, or home page you want displayed and then click Save Changes, at the bottom of that page. The next article will be about styling the appearance, or theme of your website. Then will move on to adding users, and finishing up with a review of all the final settings available in WordPress, When the Blog How To Set Up Series continues. You’ll be an expert then. Now for the reason most people use WordPress. You can change your entire site design with a few clicks. That’s right. The most daunting task a web designer faces, is handled in a few clicks. I’m assuming you are logged into your account at wordpress.com and you have clicked on one of your blog names under the My Dashboard link at the top of your screen. Now, let’s change the design of your site. Click on Appearance, on your left tool bar. The default theme is called Kubrick. You will see a preview of the theme, at the top of your screen along with a list of options. Widgets are tools that help your readers use your blog or website. Click on the link labeled widgets. You add widgets to your right toolbar, most of the time. You add them simply, by dragging and dropping them to the little box labeled sidebar on the right of your screen. You can then order them by continuing to drag and drop them inside of the sidebar. The most common widgets that everyone uses are Search, Archives, Categories, Pages, Top Posts, Links, and Akismet (a spam blocker). Previous articles explain what each of these terms mean. I’ll briefly explain a bit about the widgets that are not easily understood. Box.net file sharing: If you have an account at box.net (you can get 1 GB of space for free) you can create a folder, containing files that anyone you chose can access. Category Cloud: Displays your categories in a list and increases the font weight/size to emphasize which categories are the most important. Del.icio.us: del.icio.us, is an online service where you can manage and share your bookmarks with other people. With this plugin you can add a “Bookmark this page on del.icio.us” link to your posts or sidebar. This will allow your visitors to add your page directly into their del.icio.us profile and makes your blog more popular! Flickr: This plugin allows users of WordPress to display their Flickr photos on their own site. Flickr, is a free photo sharing website. Meebo: Meebo me lets you chat with your site visitors using your free Meebo account. Sign up for Meebo at Meebo.com. Platial MapKit: Allows you to imbed a map lookup tool on your site. People have found it to be buggy. RSS: RSS stands for Really Simple Syndication. The RSS widget will let you display entries from any RSS feed. If you want to share the posts made on other sites this is the tool for you. To find a large list of feeds go to http://www.businesswire.com/portal/site/home/rss/. If you find a feed you like click on the orange square with 3 white lines in it. This will take you to the feed. Copy the link that is in the top of your browser. Then click on the downward pointing arrow to the right of the tool labeled RSS, that you just dragged into your side bar. Paste the link into the top text box, where it states Enter the RSS feed URL here. Assign a title if you like, as well as how many posts and what data associated with each post you’r like to be displayed and then click Save. RSS Links: Are links you provide to others, to reach your RSS feeds. SocialVibe: Places an ad in the sidebar of your blog, where readers can engage and help you earn money for charity. VodPod:The Vodpod videos widget lets you display image-links to your favorite videos from around the web in your sidebar. To use this tool you must sign up with vodpod. Then paste links to videos into the VodPod drop-down in your right sidebar. These are general extras that you can enable for your entire blog. There may be an extra that will put a snow animation on the list (seasonal). The extra labeled, Enable mShots site previews on this blog, is a bit complicated.Media Shots (mShots) enable anyone visiting your site to get a glimpse of the sites you are linking to without having to leave your site. By rolling over a link a visual preview will popup showing the linked site without requiring any clicks or a visit to the linked site. This is a nice extra, hence it is checked by default. The Display a mobile theme extra should also be checked. It will automatically create a mobile version of your site for smart phone owners. Another reason WordPress is amazing! Finally, leave the last box unchecked. By leaving the Hide related links extra unchecked you will increase your overall traffic and when is that a bad thing? By clicking on the Custom Header link, you can chose to hide your title, change the text color, change back to the default color, or upload your own custom header. As it states, if you chose to upload a custom header image make sure the dimensions are 740 x 192 pixels. If you click the Header Colors link, you’ll be able to change the font color of your title, your slogan, revert back to the original colors, or click on advanced an enter the hex code for the text color you want. If you know what a hex code is use it, otherwise just change the colors using the other options. The last option is Change CSS. If you want to pay $14.97 per year to change your CSS (Cascading Style Sheet) styling on your website, you can do that here as well in other ways. I’ll cover how to use CSS in a later post, because it is a little more advanced to cover it at this time. Now it’s time to change themes. It’s so simple. If you click on Appearance, in the left toolbar, you will be taken to a page listing the most popular themes. At the top of the page is your current theme. Probably Kubrick at this time. To see what your site will look like with another theme click on Preview under the name of each theme. There are 77 possible themes as of December 2009. If you like a design click on Activate and your done. To see your new design click on the Visit Site link at the top of your page. That is everything there is to know about editting the appearance of your website at wordpress.com. In the next article I’ll cover every remaining topic being, Users, Tools, and Settings. If you want to create a little community of people who can edit your blog, click on Users in your left toolbar. Once you have created users, you’ll find their name, username, email address, role on your blog, and the number of posts they have made. For a person to be a user on your site, the only requirement is that they must have a wordpress.com account. Once they do, type in their email address and decide what access powers they will have on your site. Contributor: Can upload files, edit their own posts, but only make a post active after the administrator of the blog, probably you, give them approval. Author: Has the same power as the above, but they can post without administrator approval. Editor: Has the same power as the above, but they can also manage comments, categories, links, static pages, other people’s posts, and read / write private posts. Administrator: The creator of the blog, more than likely you. You can do anything described in this and all previous articles. Besides the Authors & Users link under the Users tab, in your left sidebar, there are two other options. Your Profile, allows you to edit information on yourself. Invites provides you with an easy way to get others to sign up for a WordPress account. As well, the two option boxes before the Send Invite button, will automatically set them as a contributor on your blog and add their site to your blogroll. The options available change on a fairly regular basis. Most of the explanations are very good for each tool so I’ll just focus on the most import issue on this page, Webmaster Tools Verification. 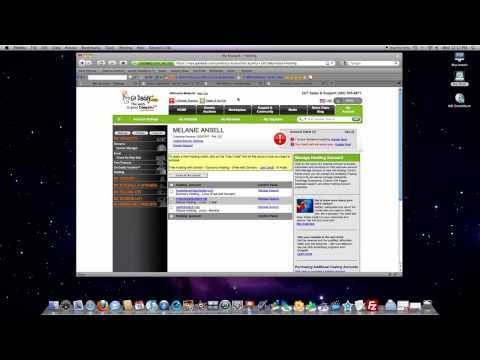 Here you’ll be able to notify Google, Yahoo, and Bing that your site exists. First, let’s set up your account with Google. Please have two browser windows open at the same time. One will be associated with your WordPress account, while the other will be to Google, Yahoo, and then Bing. Otherwise you’ll drive your self crazy clicking the back and next buttons on your browser. Now click on the underlined link Google Webmaster Tools. You’ll be taken to either your current Google account, or to a page that requires you to sign up for an account. If you don’t have a Webmaster account click on Create an account now and fill in all of the required information and click on I Accept Create my Account now. Now login to your Google Account, by typing in your email and password. Enter your WordPress URL. www.nameofsite.wordpress.com. Click on Add a Site. A note will popup that the site is not verified. Copy the meta tag data, which will look similar to this <meta name=”google-site-verification” content=”x1RlZcaGb6WWTNnSB-tjBG4-_sv4CZ23X2QdKbd3zKw” />. Go back to the WordPress Tools page and paste that code in the required box and click save changes. Now go back to your Google Webmaster account page and click verify and now Google knows your site exists. Now goto https://login.yahoo.com/config/login? in your browser. Create a Yahoo Account there. Login and then click on the link titled My Sites in the Yahoo left toolbar. Enter your WordPress URL. www.nameofsite.wordpress.com in the text bar under the words My Sites and click Add My Site. Now click on the link labeled Authentication in the Yahoo left toolbar. A new page will open. Click on the link By adding a META tag to my home page. Copy the meta tag there, just as you did with google, and paste it in the WordPress Tools page location designated for Yahoo meta tags. Go back to the previous Yahoo page and click on the button labeled, Ready to Authenticate. You’ll receive a note that your site is pending authentication. Your now signed up with Yahoo too. Click to go to the Bing signup page, just like before. Create an account there or logon to your current account. After you sign in by entering your email and password click on the button labeled Add a site. Enter you web address, just like before. A site map address, if you have one and your email and hit submit. Copy your meta tag below the line that is called Meta tag authentication. Go back to WordPress.com and paste the tag there. Click on return to site list on Bing, save changes on WordPress and boom your done. Don’t worry all of that hard work will pay off in the future. In a future article I’ll cover submitting to all of the other search engines and directories. There are other great tools available and you should take the time to read them over. Like I stated before, they change often so I’ll leave this one subject for you to explore on your own. Wow, we are almost done. I’ll go through the Settings options, available in the left toolbar and then your just about a WordPress expert. Your General Settings cover your blog name, slogan (tagline), language, email, timezone, date format, time format, and the day you think the week starts on. Very self explanatory. The Writing link will allow you to define how long an article can get before a person must hit more to continue reading it. Leave both of the Formatting boxes checked. Define your default, or favorite post category and link category. And here again you can decide if you want to be able to post by sending emails to a predefined address. I talked about how to do that in a previous post. We visited the Reading Settings page, when we changed the front page into a static page in a previous article. Hence, the first option will allow you to display your latest posts or a static page on your home page. The other options on this page allow you to describe how many posts to display on each page and in RSS feeds. If you write very long posts, click on the Summary option. Why not tick all of the options under, For each article in an enhanced feed? And finally, leave the encoding option alone and of course click Save Changes. On the Discussion Settings page I would leave everything as is except for a few things that will really help you eliminate jerks from abusing your blog. Under the Comment Blacklist, list every bad word you don’t want others to use on your site. It will only hurt once, but will save many others from reading potty language. Leave the Media and Privacy settings set as is and of course only go to the Delete Blog page if you want to delete your hard earned blog. I don’t pay much attention to the OpenID page and if you want to pay for a premium domain name, click on the domains link. That is it for now. In the next article, I’ll go through the process of setting up a WordPress.org site. That is a site that is hosted on a separate isp away from WordPress. Hope the information helped.